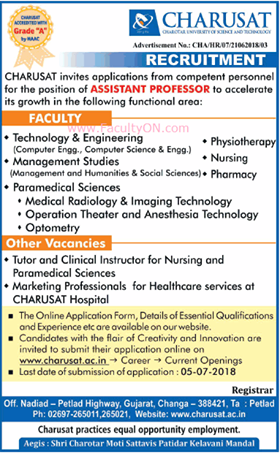 Charotar University of Science and Technology, Gujarat has advertised in Times of India Newspaper for the recruitment of Assistant Professor job vacancies. Interested and eligible job aspirants are requested to apply with in 5th July 2018. Check out further more details below. About College: Charotar University of Science and Technology (CHARUSAT) has been conceived by Shri Charotar Moti Sattavis Patidar Kelavani Mandal - a not for profit premier education trust of India having a social lineage of more than 118 years. CHARUSAT has been established by promulgation of Gujarat Private University Act, 2009. It is empowered to confer degrees under Section 22 of UGC Act, 1956.